Over 900 of the world’s 40,000+ spider species are commonly known as tarantulas (family Theraphosidae). Among them we find a staggering diversity of sizes, colors, and lifestyles, and many species that make interesting, long-lived pets. In the early 1980’s, I had the chance to work with the huge collection of a long-time friend, now a noted arachnologist. Several species in that collection were (and remain) little known in the hobby or zoos. 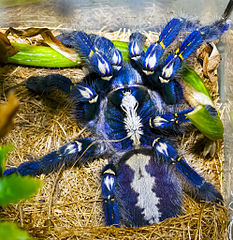 Today, a wide variety of pet tarantulas, including such long-time favorites as the Mexican Red Leg (Brachypelma), Chilean Rose-Haired (Grammostola), Pink Toed (Avicularia) and the massive Goliath Bird-eating Tarantula (Theraphosa blondii), are now regularly bred by hobbyists. The key to success with tarantulas is an understanding of their lives in the wild. 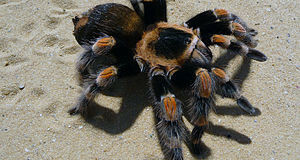 Following is an overview; please remember that tarantulas are an extraordinarily diverse group, so details will vary. Please post below for information on individual species. While the fangs, or chelicerae, of typical spiders move from side-to-side when grasping prey, those of tarantulas are employed in a downward strike. Tarantulas are also distinguished from other spiders by their unusual respiratory organs, known as book lungs, and by the presence of 2 claws and adhesive pads on the tips of the legs. The defensive, urticating hairs of New World species are also unique among spiders (please see “Handling”, below). One typically sees tarantulas referred to as “primitive” spiders, but they quite successful (please see “Range and Habitat”), and may be the dominant invertebrate predators in many environments. Females of several species may live into their 30’s, while males rarely exceed 1- 4 years of age. The cool peaks of the USA’s southern Appalachian Mountains do not generally come to mind when one thinks of tarantulas, but they are home to the world’s smallest, the Spruce Fir Moss Spider, Microhexura montivaga. 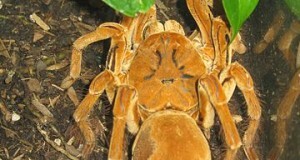 This rare tarantula tops out at 1/8 inch in length, while the massive Goliath Birdeater (Theraphosa blondii) of northern South America sports a 12-inch leg-span. Tarantulas inhabit every continent except Antarctica, and may be found in Africa, the Middle East, southern Asia, Australia, New Zealand, the Indo-Pacific, Micronesia, Central and South America, the southern half of the USA, and the Caribbean. They reach their greatest diversity in the tropics, but several occur in temperate regions. Among tarantulas are found habitat specialists (the Spruce-Fir Moss Spider is limited to moss-covered boulders in the southern Appalachians) and generalists, and ground-dwelling, burrowing and arboreal species. Habitats ranging from the world’s driest deserts to its wettest rainforests have been colonized. Others are adapted to life in swamps, rocky outcrops, thorn scrub, open forests, grasslands and even agricultural areas, gardens, and human residences. In 1705, Swiss naturalist Maria Sibylla Merian included, in a book on the insects of Suriname, a painting of a Pink-Toed Tarantula consuming a hummingbird. The name she coined, “bird-eating spider”, remains in common usage. I’ve always considered it a bit “dramatic”, but after studying large tarantulas in captivity, and observing several species in the wild, I’ve revised my thinking. Most tarantulas tackle a wide range of creatures, with the huge Goliath Bird Eaters and similar species being especially aggressive ambush predators. I remain astonished by the feeding responses of hungry tarantulas. 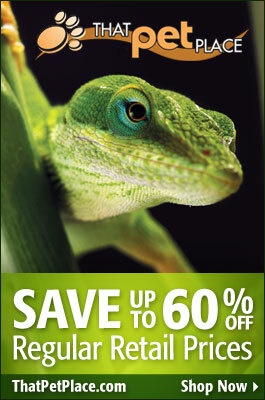 During my years at the Bronx Zoo, I had access to the world’s leading herpetological journals. Perusing them, I learned that, in many habitats, tarantulas are the major predators of certain frogs, lizards and small snakes. While insects likely comprise most of the diet, other spiders, centipedes and small rodents, are taken when the opportunity arises. While I have not found published reports, it would seem that bats and birds could be taken on occasion. Tarantulas are largely nocturnal, but well-adjusted pets often emerge to feed by day. A black/red reptile night viewing light will allow you to observe them after dark. Most tarantulas wait at burrow entrances or similar sites to ambush passing prey. They do not use webs, but silk lines deposited on the ground serve to warn them of approaching animals. Tarantula care is relatively straightforward. A wide variety of reptile products, including terrariums, caves, various substrates, ceramic heaters and canned insects may be put to good use by the tarantula keeper. Please see this article for information on useful tarantula supplies, as well as those linked below, and be sure to post any questions you may have. While certain individuals may become relatively calm in captivity, tarantulas cannot be “tamed” and should never be trusted on bare skin. If it becomes necessary to move a tarantula, do so by urging it into a plastic container with a long handled tongs; use goggles around New World species. In common with other spiders, tarantulas manufacture venom; all are capable of delivering a painful bite. Human fatalities are unknown, but the venoms of most are relatively unstudied, and an allergic reaction is always possible. New World species readily shed urticating (irritating) hairs. A Bronx Zoo colleague of mine required surgery to remove hairs shed by a Mexican Red Knee Tarantula (widely considered to be a very “docile” species) from his eye.